I’ll be honest with you—I think it’s dangerous to ask people for advice. Don’t get me wrong, sometimes we are really in a situation where we need advice from others, but not always. Many times I think we ask a bunch of people for advice because we are too afraid to take the steps we know we need to take. So, we allow others to make the decision for us. Or, sometimes we are just plain scared. We want someone to help make our situation or decision easier. Then there are times when we really need some advice on a situation. While I don’t think these situations arise on a daily basis they do happen. 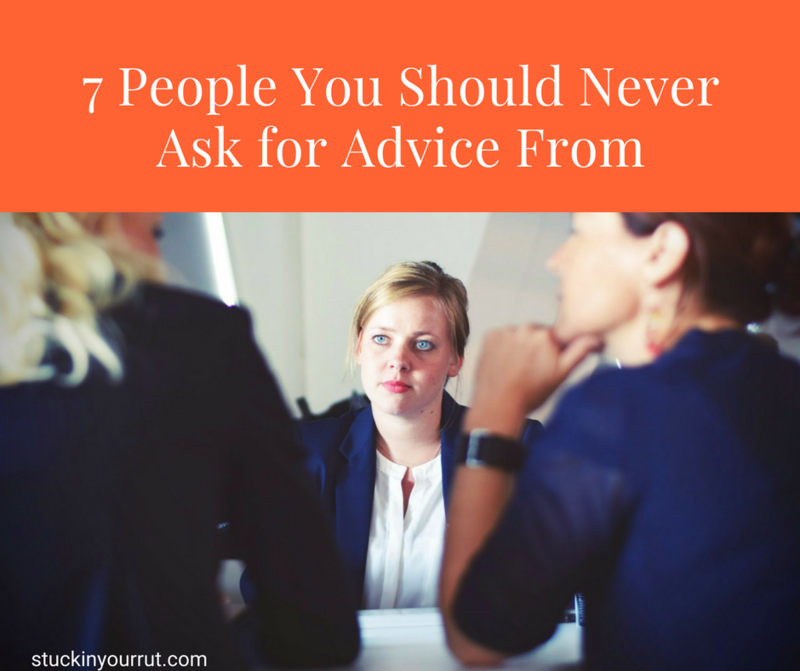 So, if you find yourself in a position where you could use some advice here are 7 people that you should never go to. She might be your best friend, but if she doesn’t have any experience in what you are trying to do, why would you ask her for advice? When you ask people with no experience for advice all you are getting is their opinion. You might be able to have a great conversation about the thing you are interested in (if they are supportive), but talking to this person gets you no closer to your goal. Now, here is one exception to the rule. Say you want to start a business doing (fill in the blank) you might not be able to find someone with experience in that exact type of business, but you can still gain valuable advice from someone that has started a different kind of business. For example, my husband and I have started several businesses over the years. I also worked at a bank for seven years helping to open business accounts. Because of these experiences, I do have some valuable advice for people that are interested in starting a business or aren’t sure what legal documents they will need to open a business checking account. So, if you want to start a bakery I might not be able to help you at all with the food portion of your business, but I might be able to point you in the right direction on the business side. So, remember before you ask for advice, think about what type of experience the person has that you are talking to. If they don’t have any experience then choose a more experienced person to seek advice from. We all have those people in our lives that are just negative about most things. You need to protect your dreams and goals from these people. It could be that these people have experienced failure in the past and haven’t moved past it or they might be negative for a different reason. But, the truth is—it doesn’t matter what their excuse is. Don’t share your plans or ask for advice from negative people because all they will feed you is negativity. You will get a long list of reasons why your idea might not work and all the things that could possibly go wrong. Friends can be great people to go to for advice, but only if they are willing to be honest with you. The best of friends are the ones that aren’t afraid to tell you the truth, even if it isn’t what you want to hear, and know how to do it in a nice way. Chances are, you know where your friends fall on the spectrum. If a friend only tells you what you want to hear, it doesn’t necessarily mean they aren’t a good friend, but they aren’t the right friend to ask for advice. Don’t get me wrong, just about every parent wants to protect their children. But, there are some that are so afraid of seeing their children fail because they don’t want them to experience hurt or pain that they never encourage them to take risks. You know if your parent is like this. Any time you tell them an idea they list off why you shouldn’t do that or what might not work out. These parents would be shocked to find out their children feel like they are holding them back. But, it’s true. If your parent is like this, they really do mean well and want to help you, but they are unable to give you the advice you are looking for. And, it doesn’t matter how old you are there is a chance that your parent falls into this category. I’m guessing that you have someone in your life that popped into your head when you read this one. This is the person that thinks they know about everything even if they don’t. They may have read an article or watched something on TV and feel like they are qualified to tell you how to handle your situation. Sometimes it is difficult to decipher what this person actually knows about and what they don’t because they truly believe that they know about whatever it is they are talking about. This person usually can talk to anyone about anything, which can be helpful for small talk, but is not useful when you need advice on something that matters in your life. If someone has settled and is unhappy with where they are in their own life, they aren’t going to be able to give you valuable advice. When you ask advice from someone it should be a person that is working hard to live the life they want and making good decisions along the way. Someone that isn’t pursuing their dreams is not going to be able to help you go after yours. Seeking wise or Godly counsel is a good thing, but you still need to really think about what this means. There are a lot of people that think that this describes them, but you might not agree. So carefully choose who you approach in this area and then remember to look at their life. Are they modeling the things they are talking about? Does the way they live their life back up what they are saying to you? Does it match up with what the Bible says? Don’t just assume because someone has been in church for a long time that they will be able to give you wise or Godly counsel. Let me share how I try to apply these principles in my own life. When my husband and I started our cleaning and landscaping business back in 2009 we didn’t tell anyone for a long time. We set up the business and spent months trying to get it going without talking to anyone else about it. We did the research that we needed to and that was it. Our friends and family didn’t know about it. In fact, we didn’t tell anyone until we already had a client that we had been working with for a while. We knew from other experiences that many people struggle with being negative. While they may think they are helping, they are actually discouraging. We didn’t want to be discouraged so we didn’t share our information until their “advice” couldn’t impact our decisions. We have never regretted doing it that way and I have carried that through in other decisions since then as well. However, recently I joined a membership group that is full of female entrepreneurs. These are women that are all pursuing their dream business. Some are far ahead of where I am and others are just starting out. This group has been valuable for me because the people I get advice from do not have the qualities of those mentioned above. Think twice before asking for advice. If you do need it, make sure you find the right person.